Maggie is tired of making friends and settling in to a new place, only to have her hippie parents decide that it is time to move on. When her boyfriend from Portland dumps her within a few weeks of their arrival in Austin TX, Maggie decides that the key thing is to NOT like a place and NOT to fit in or make friends. That way, when she has to leave, she won't have anything or anyone to miss. The problem is that the more she tries to be unpopular and escape people's attention, the more she finds her popularity growing. At first, she figures that the kids in Austin just don't get how geeky she is being, but soon she realizes that maybe she is the one who doesn't understand popularity (let alone unpopularity). Alpha Dog and this second novel by Ziegler share in common a great deal of common threads. Both feature a misunderstood girl with a bunch of oddball characters. A certain amount of drama leads to a feel good very happy ending, with everyone doing pretty well. The happy ending stuff reminds me of Meg Cabot and the oddball characters are more like Sarah Dessen. Ziegler isn't as good as either of these YA icons, but she's got a fun writing style and her books are good reads. 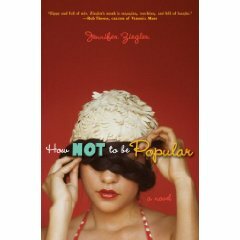 How much, though, can you relate to a girl who is popular and loved no matter what she does? THAT could get more than a bit annoying (yes, everyone will get the message of this book -- be yourself and you will be happy -- but I doubt that that is really going to work in the real world). So, this story works in a fantasy sense and perhaps in some adult's view of what high school is like (although are cliques really ever as simple as they get portrayed in books like this? ), but the moral of the story probably isn't all that useful. IMO, read this one for fun and avoid any deeper take-home message.